Our class is aimed at both students and teachers, young and old. Lessons begin with application. We will build a circuit and program the chip and then go back and look at what is happening. In order to give you the ability create your own projects these lessons will give you an understanding of what is going on behind the scenes. Arduinos and other parts you will need are available in the webshop. This entry was posted in Site Message on May 4, 2012 by Ariel Churi. The computer you will program on. Download and install the Arduino application. This entry was posted in 1 : Hello Microcontroller, Lessons on May 7, 2012 by Ariel Churi. First lets quickly go over the basics. It all starts with electricity. Electricity is the flow of electrons through a conductor like metal. We can use electrical components to make a circuit that does things like lights up. One such component is the transistor. The transistor is a gate for electricity. We can set the gates to be opened or closed. Using lots and lots of these gates we can make complex interactions. 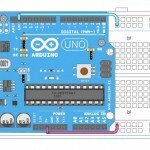 At the heart of the Arduino is a microcontroller. A microcontroller is a type of integrated circuit (IC). Which means it is an electronic circuit that has been shrunk down and covered in plastic. It is filled with transistors and when we program the Arduino we are setting the gates inside to be opened or closed. When we run the program through the chip we are running electricity through the gates to perform complex calculations. How can a bunch of gates perform complex calculations? Watch this video from Evil Mad Scientist Laboratories to get an idea. 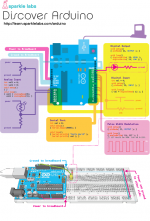 This entry was posted in 1 : Hello Microcontroller, Lessons on April 4, 2012 by Ariel Churi. Lets setup our programming environment. Our microcontroller thinks in binary. Binary means two. It thinks with transistors which are either open or closed, one or two. That may not seem like much but we use only 10 numerals (0-9) and can count pretty high. You do not need to know about binary right now because the Arduino application on our computer will translate into binary for us. 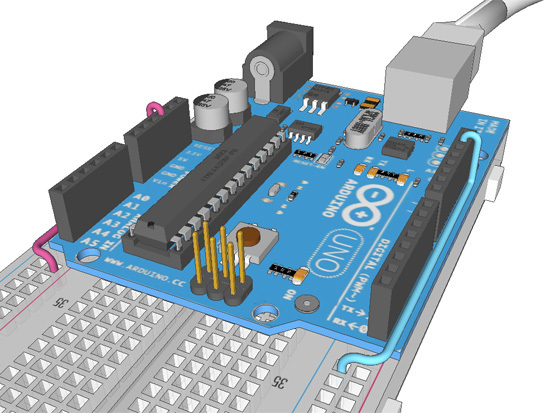 ⌁ Follow the directions on the Arduino website to set up your programming environment. Time to download the first handout. 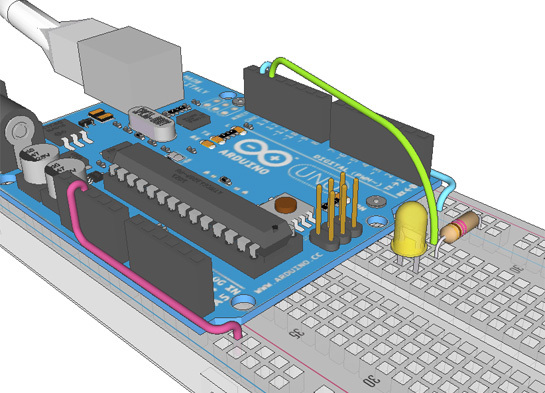 You will connect your computer to the Arduino, open an example program and upload it to your Arduino. All the example program does is cause one of the LEDs on the Arduino board to blink. Type your program in the Arduino application then press “upload” to send it to the Arduino. The application will translate into language the chip understands and then load it onto the chip. The program will begin to run right away. The Arduino does not need to be plugged into USB to work but it does need to receive power from somewhere. Create a circuit on the breadboard and connect it to the Arduino with jumper wires. Here is where the fun happens. 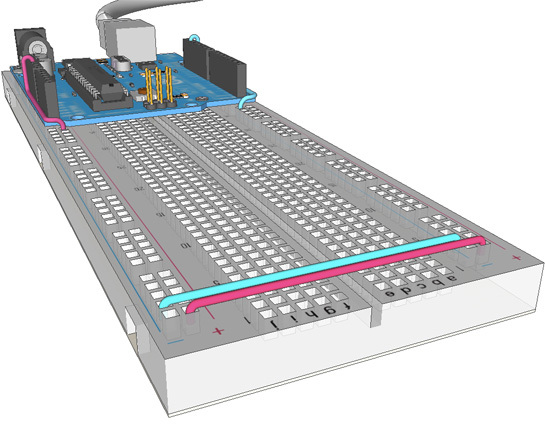 In the next section we will complete the environment by connecting the Arduino to a breadboard. 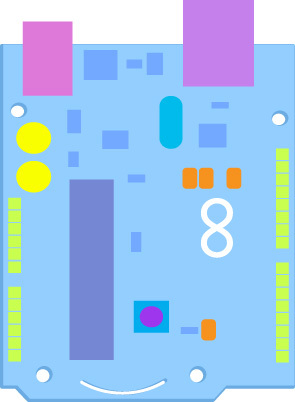 This entry was posted in 1 : Hello Microcontroller, Lessons on March 7, 2012 by Ariel Churi. First, lets connect our breadboard to Power and Ground on the Arduino board. 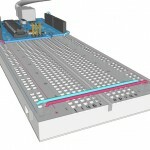 The breadboard has two long strips for Power and Ground on each side. 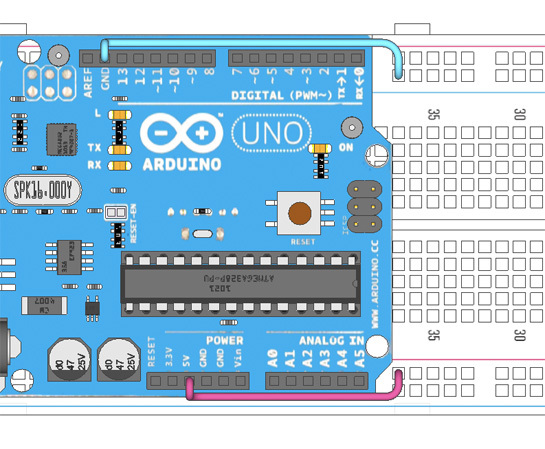 I put my Arduino right on top of the breadboard and hold it there with a rubberband or double-sided tape..
Connect the blue strip on the breadboard with the ground (GND) pin on the Arduino. Connect the red strip on the breadboard with the 5v pin in the Arduino. This will run power and ground up and down both sides of the breadboard. Connect the two sides of the breadboard together. Finally you need to connect power and ground to both sides of the breadboard. connect the two sides of the breadboard together as shown on the left. Make sure you connect ground to ground and power to power. Now that power and ground are running up and down the breadboard it will be easier for us to set up circuits like the LED driver we create in the next section. This entry was posted in 1 : Hello Microcontroller, Lessons on February 18, 2012 by Ariel Churi. Most LEDs have a shorter lead and a flattened edge which indicate the cathode. When we connected our Arduino with the computer we tested the connection by blinking an LED on the Arduino. In this section we will build an external LED circuit for the Arduino to blink. We do not want power running as we build the circuit. Disconnect the USB cable from the arduino in order to remove the power. An LED circuit allows electricity to flow through an LED and create light. The Arduino can provide power to the breadboard from the USB cable. We will use a resistor to protect the LED from too much electricity. Take a look at this schematic which shows the circuit. Power flows from Pin 13 on the Arduino, through the LED and resistor, to ground. It is important to note that electricity can flow through the LED in only one direction. The legs of the LED are called leads. The short lead goes towards ground. We call this lead the Cathode. The long lead, called the anode, goes to power. Many LEDs will also have a flattened edge to indicate the cathode. Connect Pin 13 to one of the numbered rows on the breadboard. Insert the LED into the breadboard with the longer leg in that same row. Insert one side of the resistor into the same row as the shorter leg of the LED. Now the circuit is set up and ready to run. Reconnect the Arduino to the USB cable. The blink program we loaded previously blinks the LED on the breadboard. You have your first Arduino project working! In the next section we will take a look an what is going on in that code we loaded. This entry was posted in 1 : Hello Microcontroller, Lessons on January 20, 2012 by Ariel Churi. Here is the example Arduino blink code. We call the programs we write for Arduino “sketches.” The Arduino program comes with many basic example sketches available in the file menu. Lets take a look at what is happening in this sketch. The text in grey are called comments. It is a good idea to comment your code as you write it. This is just to make the code easier for people to read. All text that appears in between /* and */ or after // becomes a comment. The computer strips out the comments when uploading the program to the Arduino. This entry was posted in 1 : Hello Microcontroller, Lessons on December 21, 2011 by Ariel Churi. The first statement is pinMode. When the Arduino reads this statement it changes what job a pin has. In this case we are telling pin 13 to be an OUTPUT pin. An output pin effects the flow electricity. It is like a switch that can be connected to power or ground whenever the Arduino says. Next we have digitalWrite. This tells the Arduino to connect an output pin to either power or ground. As with the previous statement, we need to give some information when we send the command. In this case, pin 13 and HIGH. HIGH means power and LOW means ground. When we created our circuit on the breadboard we connected Pin 13 to ground through our LED circuit. When we tell the Arduino to make pin 13 HIGH, power can flow to ground through the LED circuit. When pin 13 is LOW both ends of the LED circuit are connected to ground so electricity does not flow. This entry was posted in 1 : Hello Microcontroller, Lessons on November 22, 2011 by Ariel Churi. In order to really learn you must use your knowledge. In this section you will complete assignments that use what you have learned in section 1. Change the speed of the blink or introduce a pattern of blinking. You can change the amount of time of the delay commands to keep the LED on or off as you like. You can also introduce more and more delay and digitalwrite commands. Add a second LED circuit on pin 12. This is just repeating what you did before but now you will have to code to blink both leds. Make a pattern where the second LED blinks multiple times every time the first LED blinks. This entry was posted in 1 : Hello Microcontroller, Lessons on October 2, 2011 by Ariel Churi. Use a potentiometer to light up a row of LEDs. In this project we will set up basic LED circuits as well as a potentiometer. We will read the value of the potentiometer as we would many other types of sensors. In the code we will see some basic logic using if statements as well as mapping values to make them easy to use. This circuits reads a binary number from a DIP switch and translates it in the Arduino’s serial port monitor. This entry was posted in 1 : Hello Microcontroller, Lessons on September 20, 2011 by Ariel Churi.